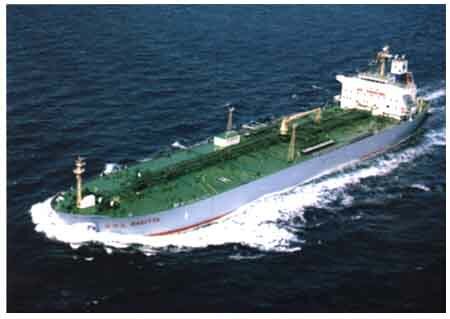 N O L SAGITTA designed and built by Onomichi Dockyard as a product tanker with a double-hull, double-bottom structure that satisfies the U.S. Oil Pollution Act of 1990. The Vessel is able to carry crude oils and petroleum products in 14 cargo oil tanks segregated into four groups plus port and starboard slop tanks providing a total capacity of 53,600m3. Loading/discharging of cargo oil is handled by 4 sets of convensional cargo pumps of which capacity is 1,000 m3/h×120m T.H. each. The Vessel is powered by MAN- B & W 6S50MC (Mark-V) with a higher energy efficiency, and designed the service speed of 1 5.3knots, which would yield a fuel consumption of 32.9tons/day and an endurance of 15,100 nautical miles.